hat it’s about: An elderly Margaret Thatcher talks to the imagined presence of her recently deceased husband as she struggles to come to terms with his death while scenes from her past life, from girlhood to British prime minister, intervene. Review: Before I start, I have a confession to make. I knew absolutely nothing about politics, Margret Thatcher, what she did and why it was so iconic before watching this film- absolutely nothing. So I went in with an open mind and this review is coming from a completely unbiased person. This film was quite a step for little old me into the big, scary world of politics and government but I must say, I thought it was very informative and somewhat enjoyable and definitely come away with a bit more of an opinion towards Thatcher than what I went in with. The Iron Lady follows an elderly Margret Thatcher as she struggles to come to terms with the death of her late husband, Dennis. As a frail old woman with Alzheimer’s, she reflects over her life from a young 21 year old girl, inspired by her father to becoming Britain’s first – and only – female prime minister. From a person who isn’t familiar with the story, I really needed something in this film to keep me watching and that thing was solely Meryl Streep. Her acting in this film was absolutely outstanding. She is the definition of grace and wisdom in everything she does but having the ability to pull off such a iconic role and give it dignity is phenomenal. 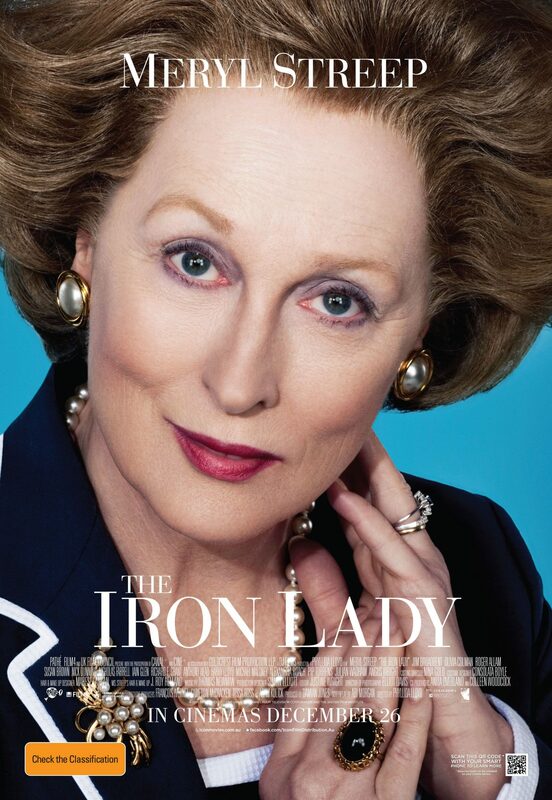 She not only looks like Thatcher but sounds like her and got her mannerisms down to a T. This film shuttles backwards and forwards between the present, when Thatcher is an old woman and during her prime as a leader and Streep manages to get both of these parts spot on. Meryl Streep is an ideal role model – particularly in this day and age for women to aspire to. I felt this film was really good at portraying how difficult and daunting it must have been being a woman in politics in an otherwise male-orientated profession. All the way from when she was 21 years-old, she was a strong, female figure with ideas and views she wasn’t afraid to express and whether you agree with her or not – you have to give her credit for that. The structure of the film wasn’t as good as it possibly could have been. Like I mentioned, it shuttles backwards and forwards and I think that could have been done a bit better so it was a bit clearer for the audience (particularly the un-informed audience) to follow. From an outside perspective, I really enjoyed this film. It offered good insight into her life both political and personal as well as what it was like being the first woman prime minister and having to come to terms with her husbands death. I felt sympathy towards Thatcher – which is something I didn’t think I’d end up feeling – because underneath her hard and strong façade, she was just another woman who went through all the struggles of life, who wanted to change the world. And that she did. Nice review Jenny. It’s a film I’m not interested in seeing really, but my wife liked it! Thanks Thomas! Neither was I really, as I said, I’m not a politics lover haha but I enjoyed it 🙂 Glad your wife enjoyed it too!